Willy Müller graduated as an architect (1984) in Argentina and pursued doctoral studies at ETSAB-UPB (1986/88). 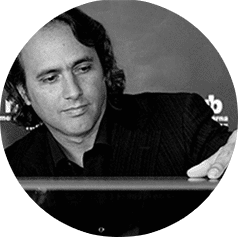 He is a co-founder of the Institute for Advanced Architecture of Catalonia (IAAC) in 2001, becoming its Development Manager in 2004. He established his own office in Barcelona WMA, Willy Müller Architects in 1996, a recognised architectural firm achieving several international awards in competitions as well as with built projects, featuring his work in numerous exhibitions. He is the co-author of several books, including Sociópolis, Media House Project, the Metapolis Dictionary of Advanced Architecture, and the Self-sufficient Housing. “Müller himself is a professional of proposals, not only for buildings but also as concepts. He has been a strong voice for putting architecture at the centre of the debate. He has been fearless in exposing his ideas personally and has worked to promote creativity and discussing all of architectures extensions. His intentions are clearly to go beyond the physical world and explore also the possibilities of interaction in a social context, the new technologies and with nature.” (Jaime Lerer, President of International Union of Architects). Müller was the Director of Barcelona Regional from 2011 until 2015.